We carry the full line of Vexus boats! Skeeter Boats: Click here to view the models. Reynolds' Boats "Water is our Passion"
Welcome to Reynolds' Boats. We are New England's premier fish boat dealership. 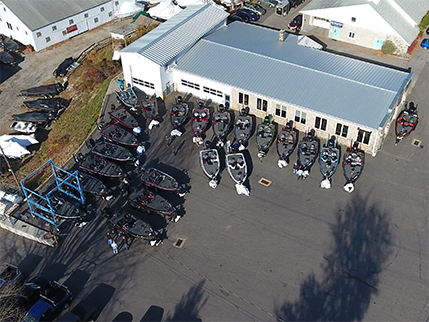 Reynolds' Boats prides itself on having the most passionate and knowledgeable staff in Lyme, CT. Our staff is comprised of fishermen that know their way around boats in the salt or freshwater. Not sure which boat is the right fit? Come by and talk to Bryan and use his 40 plus years of fishing experience to help pick out your new dream boat. Check out our brochures to see what products we offer. If you need help in making your selection, feel free call or stop in—we're always ready to serve you. Reynolds' Boats has been family-owned and operated for over 150 years with a full service marina conveniently located on Hamburg Cove. Reynolds' Boats specializes in offering completely custom rigging and the latest innovations in boating technology. We combine a wide variety of products with a friendly and knowledgeable staff to meet all of your boating needs. Our goal is to make Reynolds' Boats your one-stop dealership for sales, service, and fun!